Janice Lowe, 83, of Soddy-Daisy went home to be with her Lord and Savior on Friday, April 6, 2018. 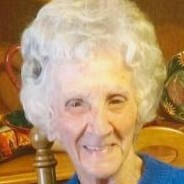 She was a member of the Soddy Community Chapel. She was preceded in death by her husband, J Bryant Lowe, parents, Charlie and Lottie West and sisters Vivian Evans and Maude Price. She is survived by her, son, Max (Teresa) Lowe, Sisters-in-law; Evelyn Spann and Carolyn Hall, along with several nieces and nephews. Funeral service will be Sunday, April 8, 2018 at 2:00 p.m. in the funeral home chapel with Larry Joe Price, nephew officiating. Interment will follow the service at Hamilton Memorial Gardens. Family will receive friends from 4-8 P.M. Saturday at the funeral home. The family would like to give a special thanks to Dr. Zeigler, Hearth Hospice staff Debra and Brandi as well as two special caregivers, Sandi and Carolyn. In lieu of flowers, memorial contributions may be made to the Alzheimer’s Association at alz.org or a favorite charity.